I just took my tax information to my accountant. With VERY FEW days off. In fact, it cost my family money for me to release the five books that I released last year. And it's one that makes me wonder why I should write today. Today, I'm sharing another tagline from my paranormal dystopian romance series, Through the Veil. 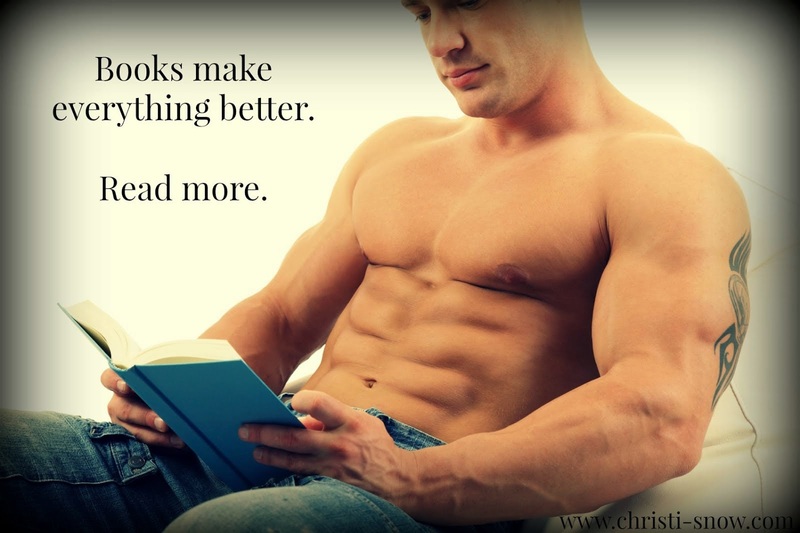 This tagline is about the hero in the first book, Marcus. Marcus is a Warrior and a workaholic...because he has nothing else left. 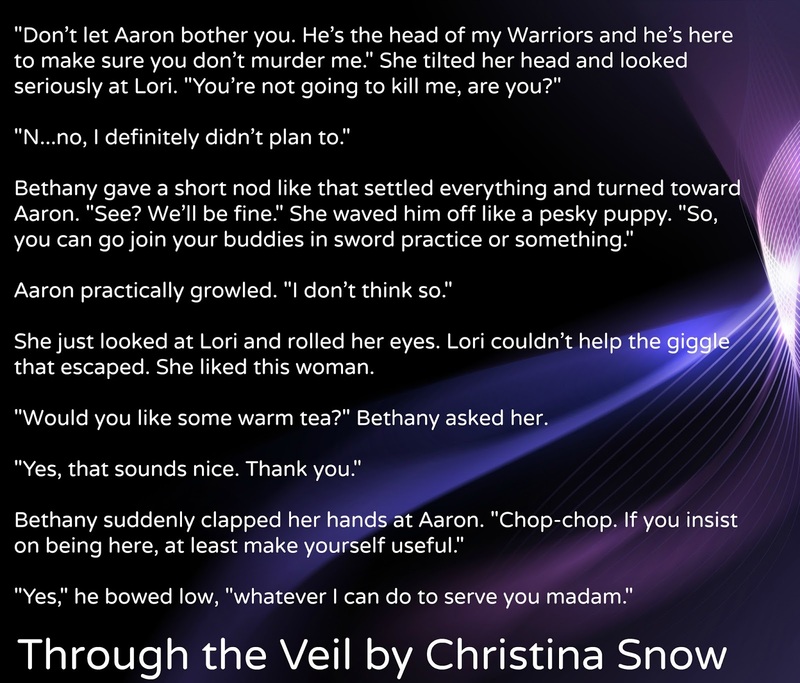 He's been through a lot, but nothing prepares him for what happens when Lori crosses the Veil. 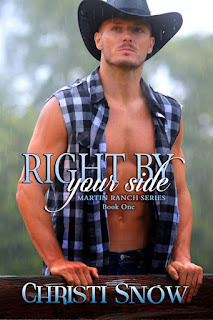 Suddenly he discovers that she's everything he never knew he was missing and that's not something that's easy for him to accept. 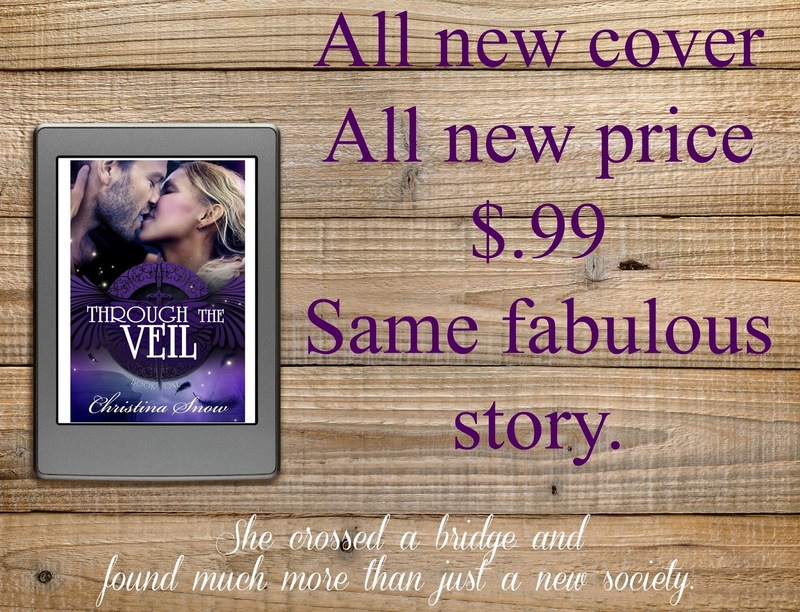 And don't forget that right now, Through the Veil, book #1 in the series is available for only $.99. You'll want to read this one before the next two come out. 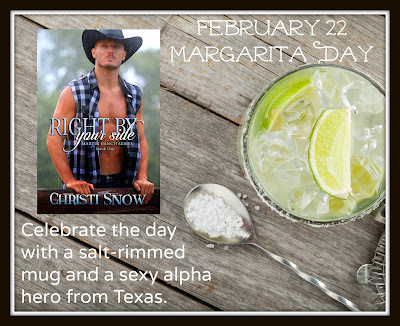 Grab a Margarita and a hot Alpha! Today I'm sharing another first line from Through the Veil. 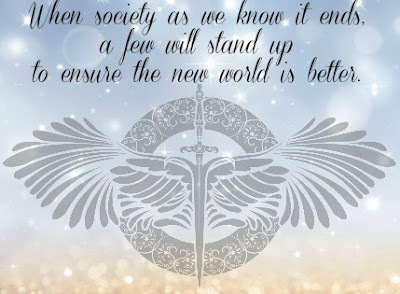 This book is the first of an 8-book series that takes place in a dystopian future world where the United States has been split into two different countries separated by an impenetrable barrier, called the Veil. On the Western side of the Veil, a woman named Bethany became the leader. She's the heroine in book #3, Rejecting Destiny. Her hero is Aaron, the leader of the Warriors, the law enforcement branch of the WS. 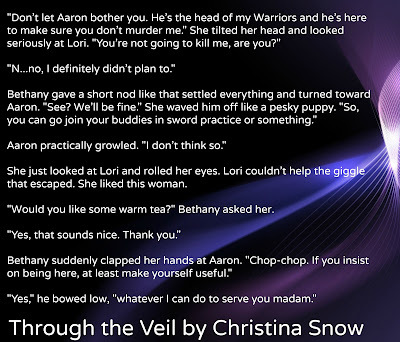 They have a great first scene in Through the Veil. 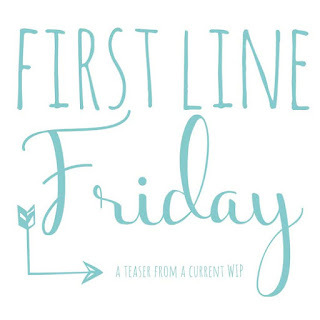 Since I just sent their book off to my beta readers (yep, #3 will be out in April), I thought it might be fun to share their first lines on the page. These two have had a relationship for twenty years and I love them together, even when they don't agree. an all new low price of $.99 for the ebook. 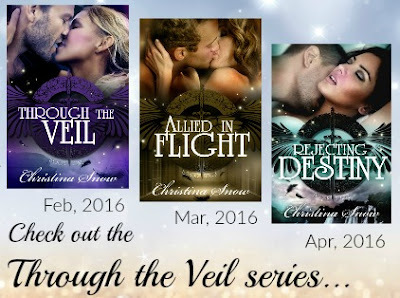 Today, I'm sharing another tagline from my paranormal dystopian romance series, Through the Veil. This tagline is about the heroine in the first book, Lori. I adore her. She's tough and brave and is everything I love in a heroine. 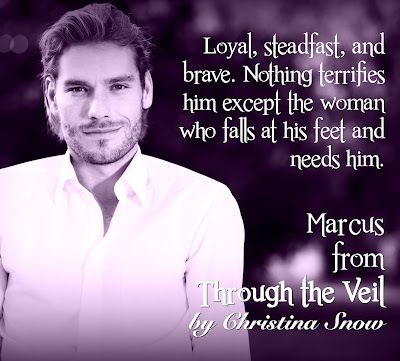 Today I'm sharing another first line from Through the Veil. TTV takes place in a world about 18 years into the future. The premise is that a natural occurrence (the Veil) separated the United States into two sides, the Western States (WS) and the Eastern States (ES) with a fog-like "Veil" in the WS that makes it impossible to cross from one side to the other. But the heroine, Lori, has special powers that allow her to cross in an act of desperation to escape torture. In the ES, life is still pretty much like how you and I live right now, but in the WS, things have changed, evolved. This scene are Lori's first lines as she wakes up to some of the shocking changes that have happened in the WS. Today, I'm sharing the first tagline from my paranormal dystopian romance series, Through the Veil. This tagline covers the entire series, because there's a huge world arc that will evolve throughout the eight books. 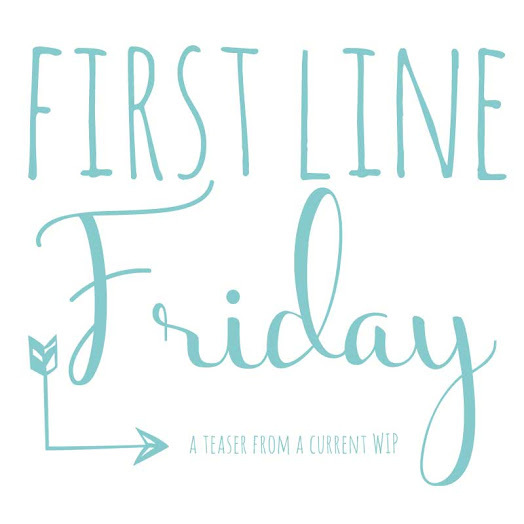 Today's First Line Friday post is going to be a bit different. I originally released Through the Veil in September, 2014. Since then, this series has intimidated me, because that book was easily one of the hardest I've ever written. Crouched behind the rock, gasping for air, Lori surveyed the decrepit bridge below swinging eerily over the deep gorge. Measured at a mile deep, the quarter-mile wide gorge was edged by stone cliffs with even more treacherous looking rocks jutting out from the bottom of it. Would that old, worn out, rickety structure support her? 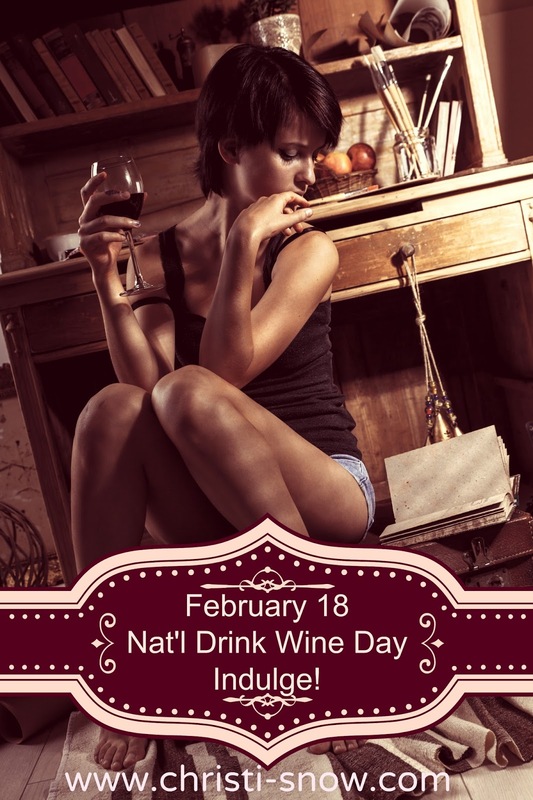 No one had been able to use it for eighteen years. 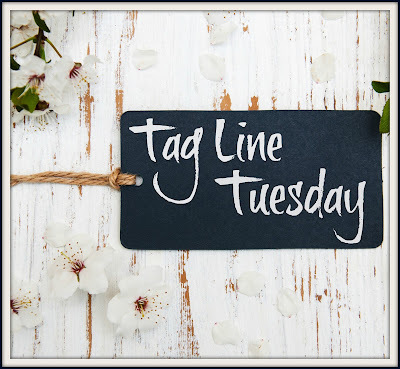 Pressing the bullet wound at her side to stem the flow of blood, she glanced behind her, trying to ignore the pain that sizzled along every nerve ending. She hadn’t heard her pursuers for several hours, but that didn’t mean they weren’t nearby. A bead of sweat rolled down her spine as she glanced at the bridge again. It had been built decades ago, a few years after the gorge had suddenly appeared. And, damn, that gorge looked scarily deep right now. The only reason Lori even knew about this bridge was because her family came here for vacation a year before the Veil appeared. The riskiness of climbing this bridge so far above the ground became the highlight of her trip back then. She’d been nine years old at the time and it remained as one of her best memories of time with her family, a family that disappeared from existence ten months later. Now this bridge featured as both her nightmare and salvation. If she stayed on this side of the gorge, the men after her would kill her—or worse, imprison her again. She’d rather die than spend any more time as a lab rat. And with the blood oozing from her side, that remained a very good possibility. Survival meant she could come back and help the Others escape, too. 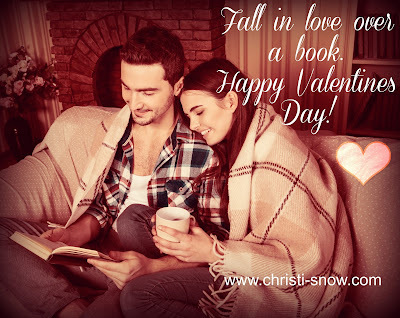 Gritting her teeth, Lori stood and crept down the hill. The closer she got the more flimsy the bridge appeared. It was simply a foot bridge made of wood and rope, suspended across the gorge. The irony of the situation didn’t pass by her. They only wanted her for her gift. She counted on her ability to manipulate space to save her life now. But she had to escape. If that meant using every last drop of energy she had, she would. She let go of her side and sucked in a breath to focus her concentration. Grasping the rough ropes, she took her first step onto the bridge. It shifted slightly under her weight with a creaking sound which reverberated through the quiet of the surrounding forest. It was as if nature held its breath to see if she would survive this. The swaying bridge took more effort from the muscles of her core. She hissed at the added pain and fought off the black spots encroaching on her vision. Glancing behind her, she didn’t see any movement except the leaves rustling on the trees. 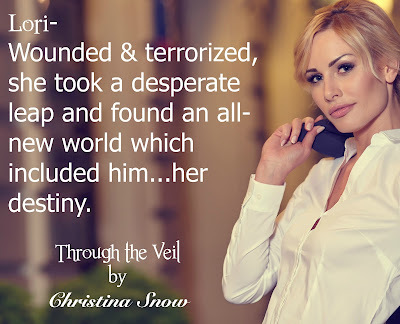 Looking forward again, she tried to peer through the Veil to the other side. She had about fifty feet of bridge before she hit the wall of fog. 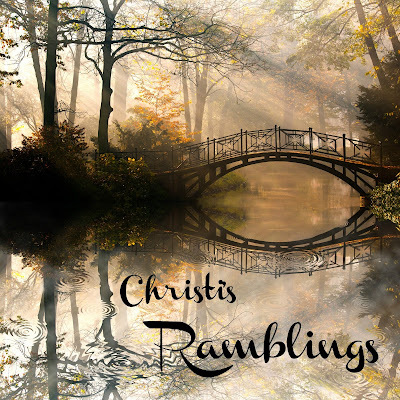 Slowly, she edged her feet across the rough wood, stepping gingerly to avoid falling through the rotted boards. The farther out she creeped, the more the bridge swayed over the huge expanse. She couldn’t look down. Her breath came out in gasps as she inched across. 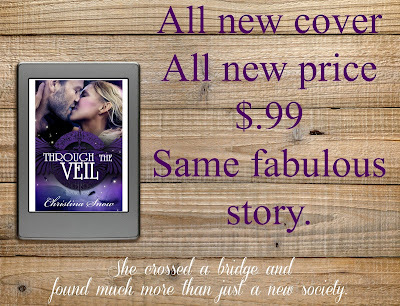 Finally, she reached the Veil. She reached forward with a hand, and could feel the semi-transparent barrier like a huge wall in front of her. She closed her eyes and gave a silent prayer this would work. Lori swung around. Men in camouflage holding guns poured out of the forest behind her. Damn. This was her final chance. She closed her eyes and faced the Veil again. Using every ounce of energy she could pour into it, she focused on creating a hole big enough she could climb through it. Finally, the energy moved and the wall shifted. She scrambled through the invisible hole she created. 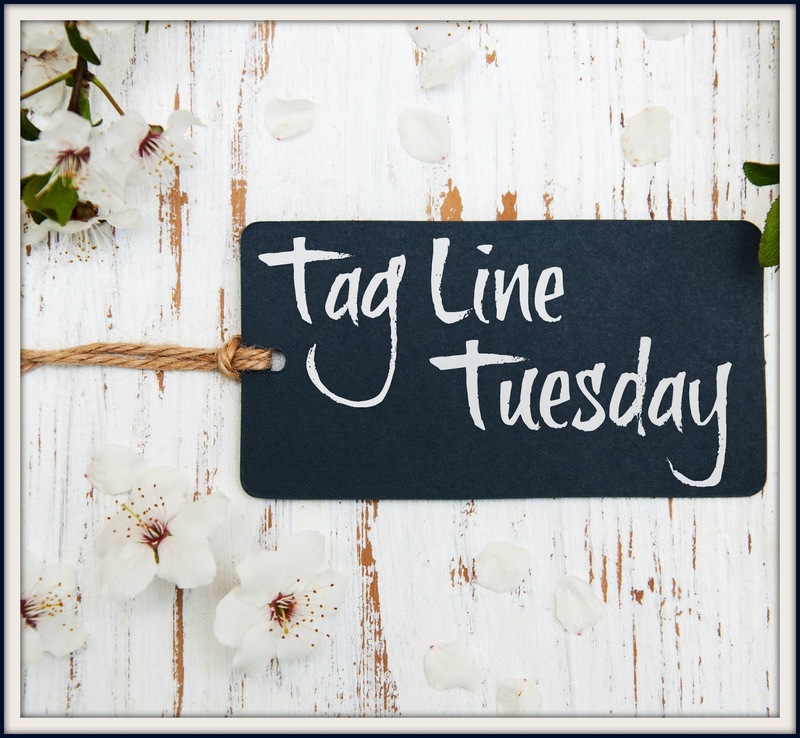 Once through, she let go of the energy to seal the wall back up and not a moment too soon, as the energy reverberated under the hail of bullets striking it. But she couldn’t see or hear the men on the other side anymore. The fog had enveloped her. She held onto the rope supports and felt her way across the rest of the bridge on wobbly knees. She’d made it through. Falling wasn’t an option now. When the solid ground of the other side met her feet, she collapsed in exhaustion and relief. She lay there gasping and trying to find energy to stand. 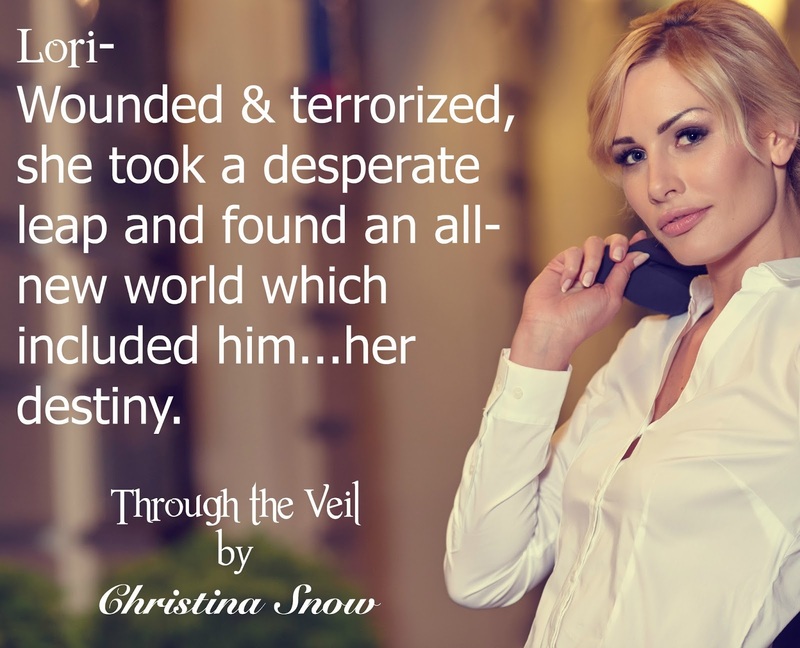 Manipulating the Veil had taken everything she had. The darkness was slipping over her consciousness when strong arms lifted her up. 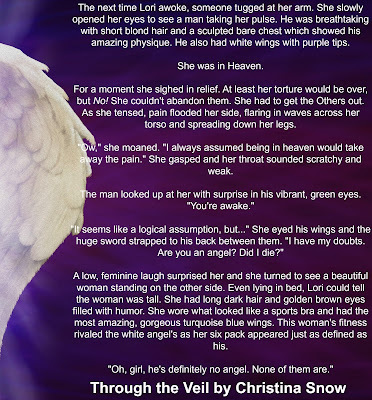 The fog still surrounded them, but that didn’t keep her from seeing the gorgeous, scowling, concerned face of the man holding her against his naked chest or the dark purple wings at his back. That was the initial scene I wrote. Then I wrote the next 35,000 words in 7 days...with no plan, no plotting. That is NOT how this girl writes. As a result, it took another two years to sort out that initial 35k and add another 40,000 words onto the top of it. The result was a story and the beginning of a series that I adore. But from the very beginning I knew that to tell the story fully of this dystopian world, it would take quite a few books...8 in fact. That's more than a little daunting when the first book took me over two years to write. LOL. 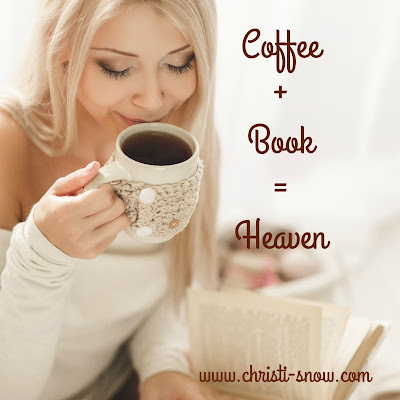 Luckily I've worked through that block and actually have both books #2, Allied in Flight, and #3, Rejecting Destiny, written. They will be releasing back to back in March and April. 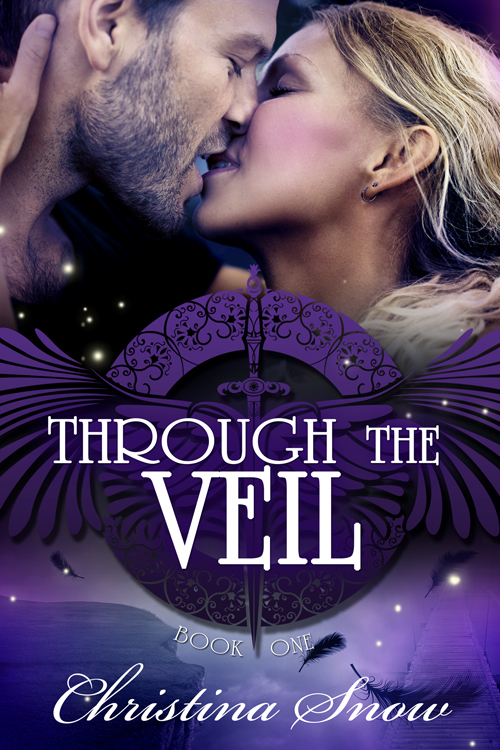 And to prepare for that, I had my designer do a complete redesign on the cover of the first book, Through the Veil. The print version isn't available yet, but it should be up next week. 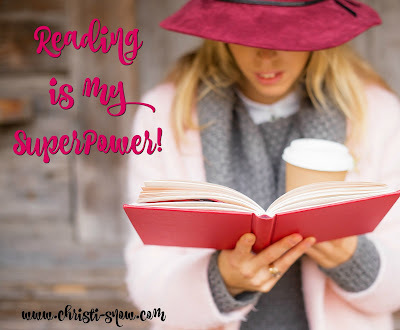 When am I a real author?